The Phoseon Firefly™ is a high performance air cooled UV LED curing system now available from Intertronics as part of their LED adhesives and curing package. 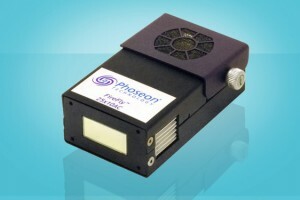 The Phoseon Firefly™ is a range of compact solid state UV devices that provide high power output – in the 4W/cm2 to 8W/cm2 range with approximately 80% power and heat savings compared with mercury based lamps. They are seen as offering many advantages when curing inks, coatings and adhesives in electronics, as well as medical device and other high technology manufacturing. The Firefly™ LED system features instant on/off and its cooler operating temperature makes it possible to cure on heat-sensitive substrates, with the added benefit that no ozone is produced in its operation and it is mercury-free. The Firefly™ LED lamps produce up to 8W/cm2 peak irradiance at 395nm with output geometries from 25x10mm up to 150x20mm. For further information please see www.intertronics.co.uk/phoseon or visit their blog at www.adhere.uk.com – also see www.youtube.com/intertronicsadhere.